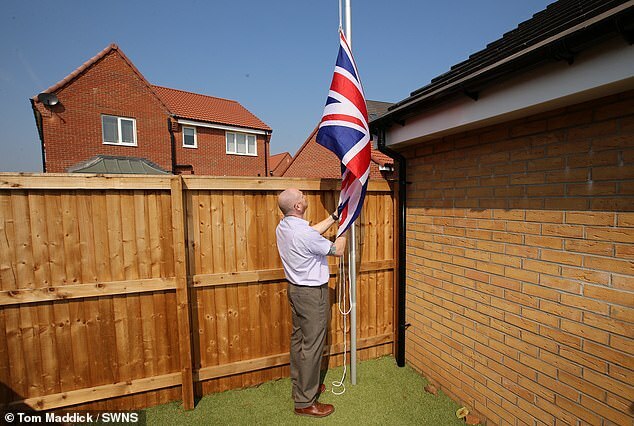 Andrew Smith, 51, installed the flag on a pole in his garden in Hucknall, Nottinghamshire, in tribute to Great Britain after serving six years in the Royal Signals. The father-of-two has so far complied with the notice but is now fighting back because he is ‘proud to be British’. 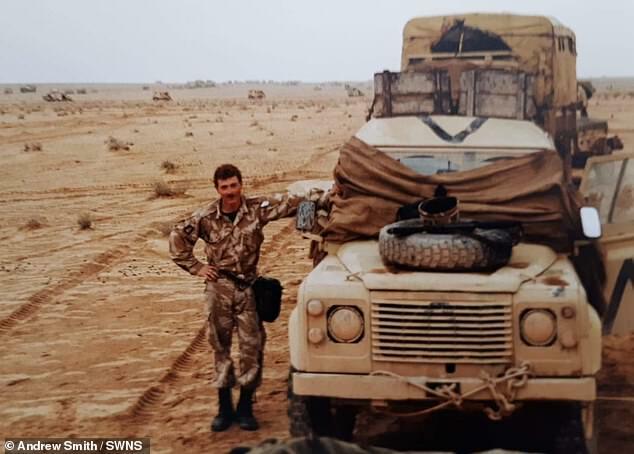 Mr Smith served in the British army between 1988 and 1994 and saw action during the Gulf War. But Mr Smith says a disgruntled neighbour complained to bosses at Harron Homes who he claims have warned him to take down the flagpole or face legal action. 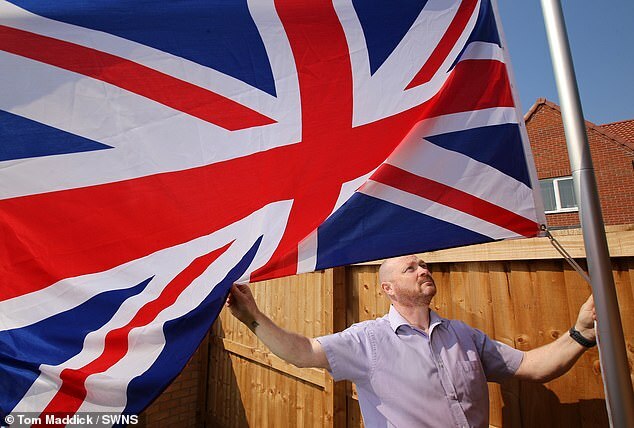 ‘I can’t see why a union jack flag is offensive. Why would you be offended by patriotism? ‘We have become soft and don’t want to upset other people, whereas I have done my bit for my country and I’m proud to be British. Mr Smith, now a project manager, moved into the property in Hucknall with his wife Trigania, 28, in October last year. The couple previously lived in Chilwell, Nottinghamshire, where Andrew flew the flag without incident for 10 years. 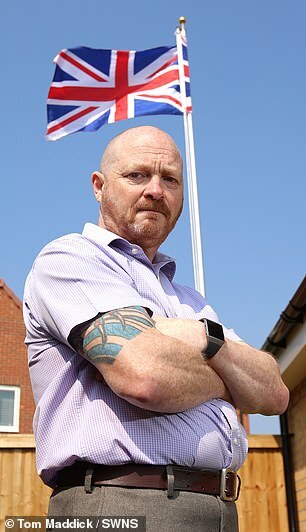 He asked locals on the Sandlands Park Facebook group page in February this year whether anyone would be offended if he installed a pole and union flag in his back garden. Mr Smith says he received more than 70 positive comments and decided to go ahead, but heard a knock at the door within hours of putting it up from a disgruntled neighbour. Mr Smith, a project manager, said: ‘Whatever I signed when I bought the house said I wasn’t allowed to do anything that causes a nuisance or annoyance. ‘I asked on a Facebook group ‘is this going to offend anyone, I’m proud to serve?’. ‘People said ‘go for it. I got 31 love heart emojis, 20 thumbs up and 70 positive comments. ‘Then I got a knock at the door from a neighbour round the back who said ‘we don’t like that, are you going to take it down?’. ‘They probably knocked on the door around 20 times over the next three days but I just ignored it. 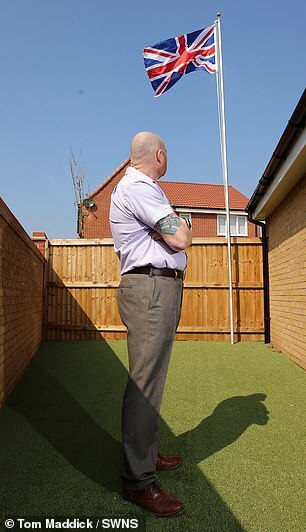 ‘Then we got a letter from Harron Homes saying they had been instructed by a solicitor that I have to take the flagpole down because it’s causing a nuisance. The flagpole is not a permanent structure and Andrew intermittently switches the union flag with the England flag which he puts up during football and rugby matches. 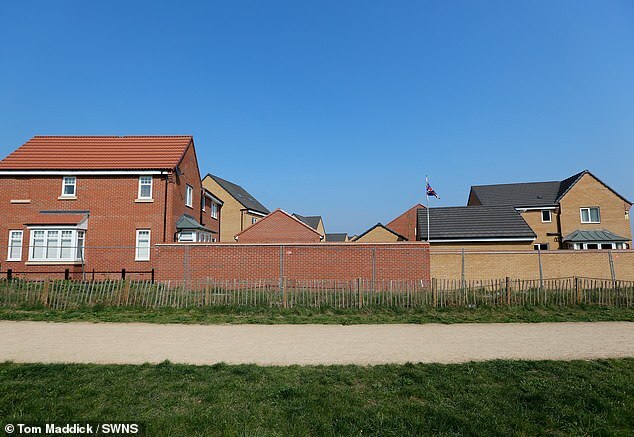 A spokesperson for Harron Homes said: ‘On our development in Hucknall, we were alerted to a complaint by one of the residents about a flagpole in the garden of an adjacent property. ‘The restrictive covenant signed by all homeowners does not allow for the placement of any structures i.e. flagpoles above a certain height, which could be viewed as an annoyance and nuisance to fellow residents. ‘We simply asked for the pole and flag to be removed in line with the residential agreement, due to a neighbour’s complaint.